Cat Owners Rejoice! This Mat Traps 75% More Litter Because of the Honeycomb Design. Now You Can Effortlessly Prevent Messes, Protect Your Floors With This Great Looking And Easy To Use Litter Mat! Improve antibacterial ability and reduce the growth of harmful bacteria such as Campylobacter, MRSA, E.coli, Listeria, Salmonella and many other species by up to 99.99%. The Honeycomb designed mat holds tiny pieces of litters fallen between the layers, automatically catching debris as cats exit their litter box.Each size mat supports all types of cat litter, including clay, crystal, corn, clumping, wheat, and pellets! 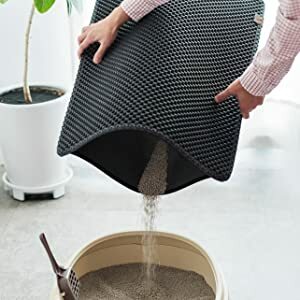 This cat litter mat features a “honeycomb” top layer that lets litter slide in through the holes and trap it on the solid rubber bottom. To empty it, simply spread either end of the two layers apart and let the debris fall into the trash or quickly reuse in the litter box with little to no mess. Large in size, these rectangular cat litter mats prevent litter from tracking or scattering across floors to minimize the spread of bacteria and maximize cleanliness. When you receive our mat, it may have a new rubber smell; let air out for a few days to eliminate it. The waterproof trackless litter mats are made of soft EVA foam rubber that’s easy to wash with soap and water. When finished let air dry and avoid direct sunlight to protect material. Bottom layer is waterproof which will not allow any liquid to go through. Protect your hardwood floors and carpets from nasty urine stains. Regular cleaning by running water is recommended.